Another snowfall added to what we had changing our weekends plans AGAIN. Unfortunately, we’ll have to get together with our friend for his birthday later. On the positive side, I got all the pinwheels done! 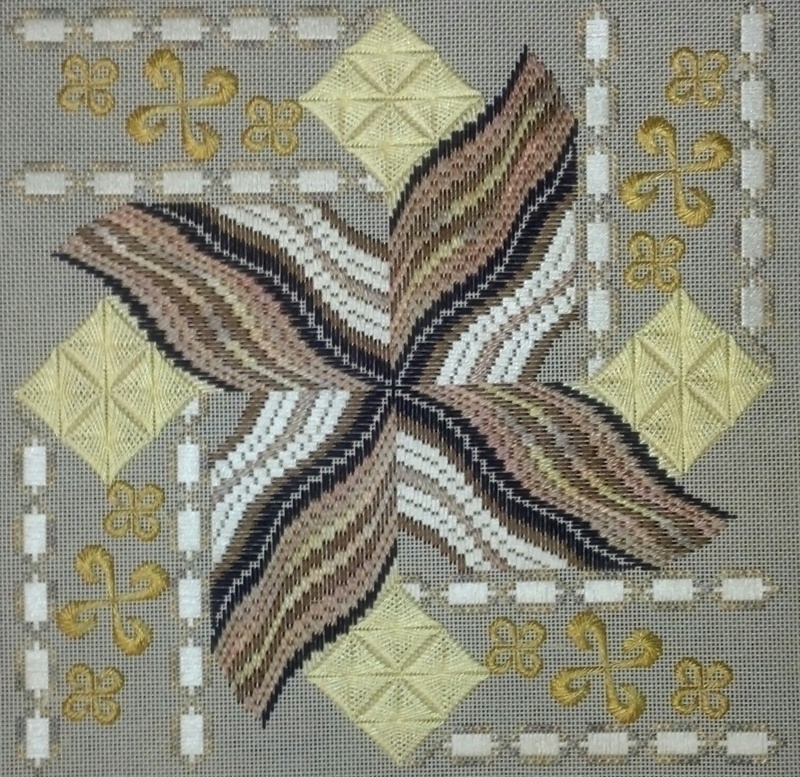 In Tootsiebubbles, there are 636 Smyna Cross stitches which I have done with Toasted Marshmallow (SNC 255) Silk ‘n Colors from The Thread Gatherer. It is a hand dyed, 100% silk, 12-ply floss. I took about a 24″ length and placed 2 plies in each of the 4 quadrants before I started stitching. 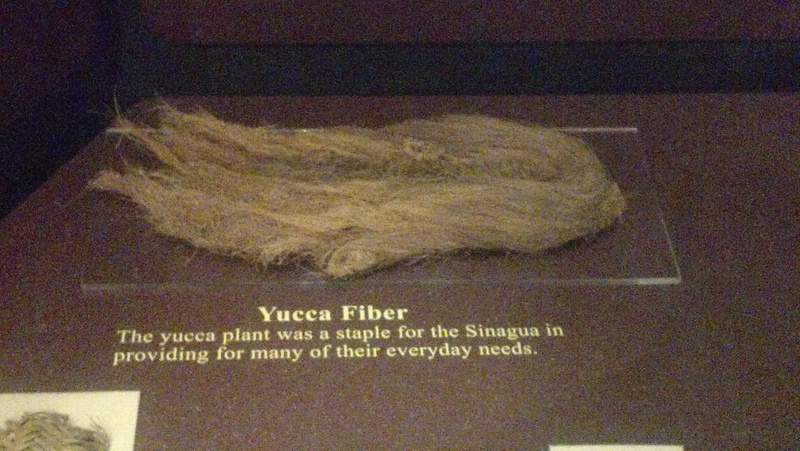 That way, the flow of the over dyed plies is identical in each section. Had this been a 6-ply thread, that would not have been possible. The idea came to me right after I finished the first quadrant. Now that I am done, I am not sure anyone would actually notice though. Oh well! 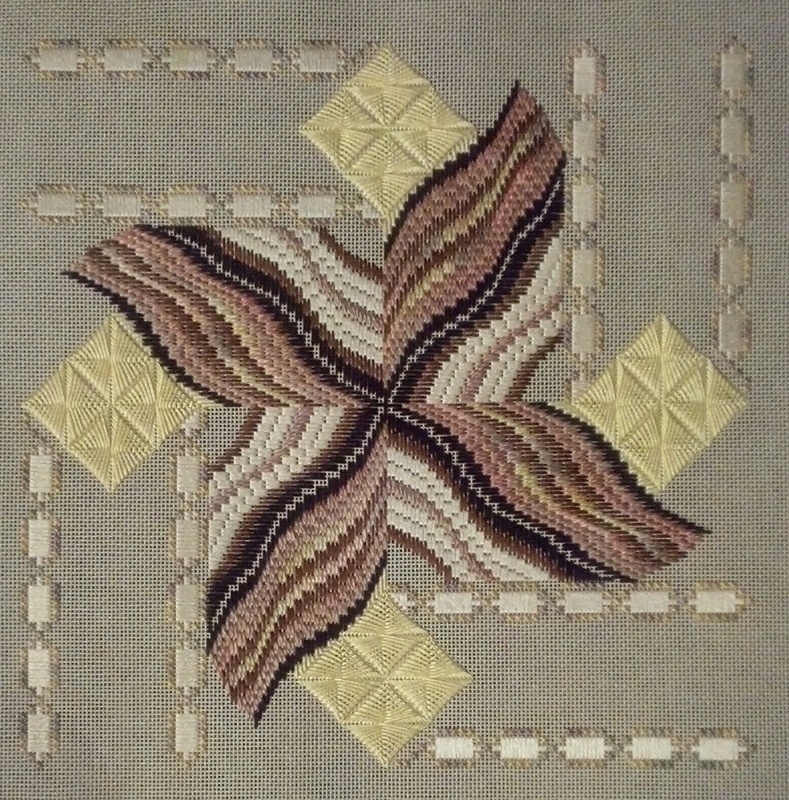 In between the crosses are straight stitches with 4 threads of Splendor (S818). By the way, never count the number of stitches in a piece until after you stitched them. 636 Smyrnas sounded overwhelming but I did them in 2 batches and added the straight stitches to get a break from them. And, they actually worked up quickly. In Old Town Needlework, the third and final store of the day, I spent most of my time selecting Vineyard Merino threads for Bargello Techniques (which will be the subject of another blog). 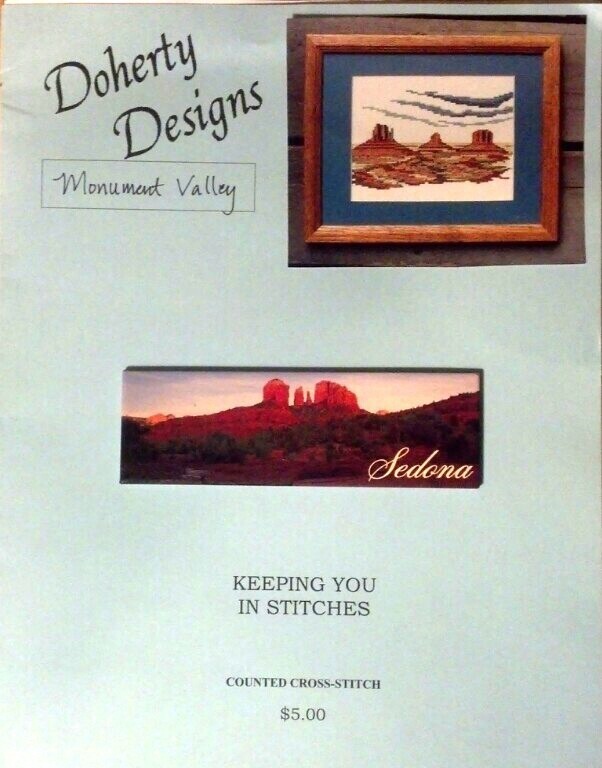 But, I found this counted cross-stitch design of Monument Valley from Doherty Designs which is on the Arizona-Utah border. It was like the scenes and colors we saw in Sedona. For $5, I had to get it. They had Aida cloth and DMC threads in the kit for $24 – pays to have stash! There are only 12 colors. The colors were so vibrant in person – I may try to stitch one my photos. There is a magnet sitting in the middle of the booklet in the photo. I was impressed with the Grand Canyon when we saw that a few years ago & this is just as or more impressive of an area. My second stop in Arizona was Quail Run Needlepoint where I picked up a Christmas Cactus ornament. Particularly appropriate because we spent Christmas in Arizona & had sent a picture of Bill standing next to a big cactus saying it was our Christmas Tree this year. We were amazed at how big they grow. Later, we did see a few decorated ones. Eventually, we’ll have a decorated cactus as a memento. Perfect! I found the most incredible thread for it too – Sea Grass (104) from The Thread Gatherer. It is flat & thin – will really elongate the natural shape of the cactus. Then, the gold Rachelette (A47) will criss-cross on top of the Sea Grass. 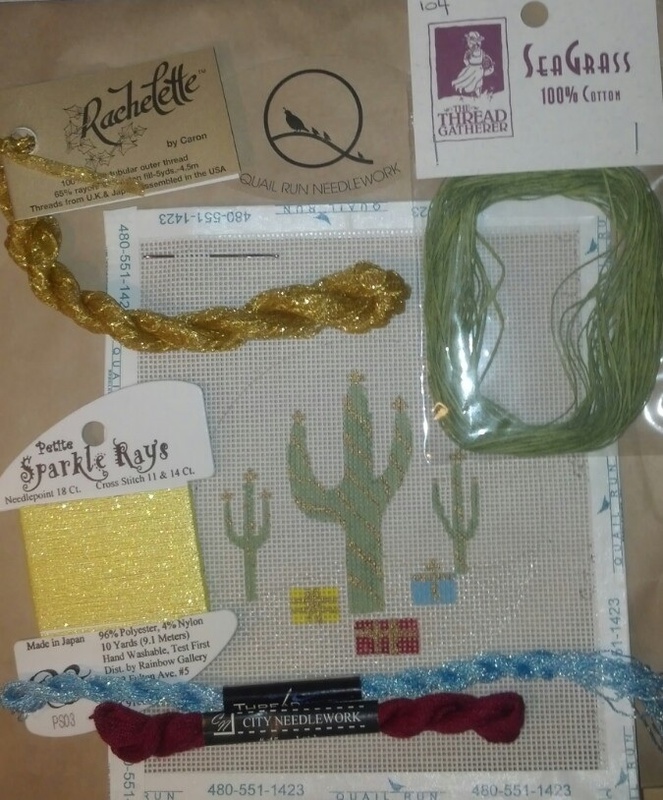 Not that I needed much for the gift boxes but I picked up Sparkle Rays (PS03) for the yellow gift box and ThreadworX #8 braid (710541) because I doubted I had any bright yellow or blue in my stash. 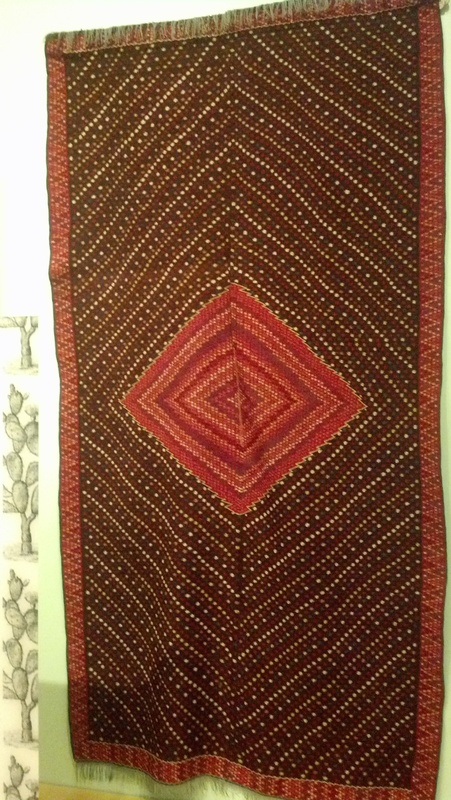 While I knew I had enough reds to choose from, I never tried City Needlework thread (#45), a Chinese silk. The Quail Run seal matched the brown bag and was a perfectly fine presentation. The edges of the canvas were taped. And, I got a 10% ANG discount. They had the books, charted designs, painted canvases, Watercolours, and Waterlillies. So far, 2 wonderful stores! I found a note that this piece is called “Western Star” by Katrina at Quail Run. Katrina doesn’t have an internet presence. She lives in the mountains of Colorado & comes into the store periodically and sells her painted canvases. It will make a wonderful remembrance of Christmas in Arizona! While in Arizona, I visited 3 needlepoint stores! 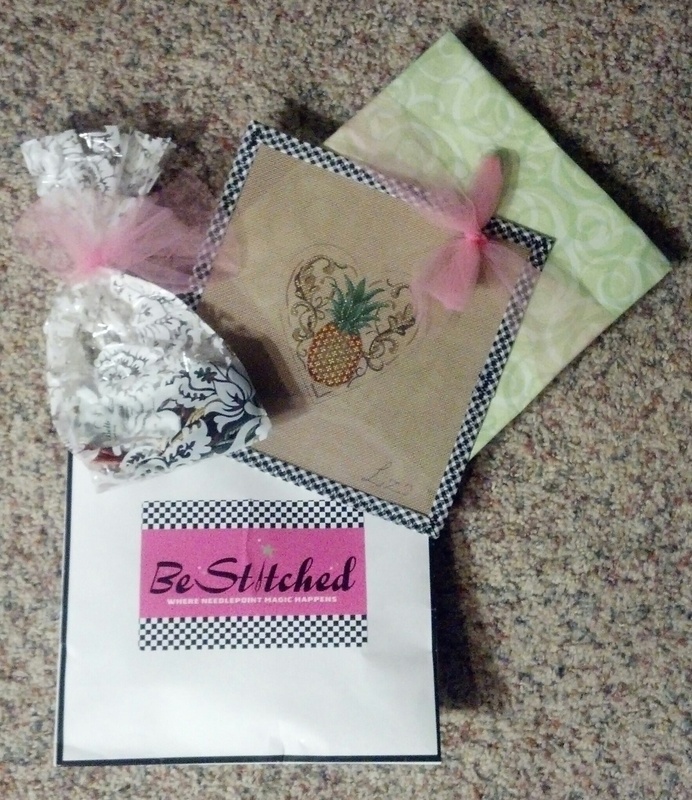 At BeStitched Needlepoint, I picked up a pretty pineapple design & Belle Soie, a silk floss, that I have not tried before. The design is a Liz Goodrick from Susan Roberts Needlepoint Designs. I thought it was interesting that the store only had painted canvases. No books or charted instructions. And, no Watercolours and a half-dozen Waterlillies. Plenty of other threads such as Vineyard, Planet Earth, etc. They sewed the fabric border on the edges before I left the store, gave me suggestions on how to stitch it, and packaged it up so pretty that I have to share that picture too! When I unwrapped it (which just happened today because we shipped some souvenirs home & I have been swamped at work), I notified that the black and white fabric border (which may be called bias tape? Even though not tape material?) matches their bag! Of course, I realize these touches come at a cost (no ANG 10%). I like to try fibers but this probably belongs with basket weaving not needlepoint. 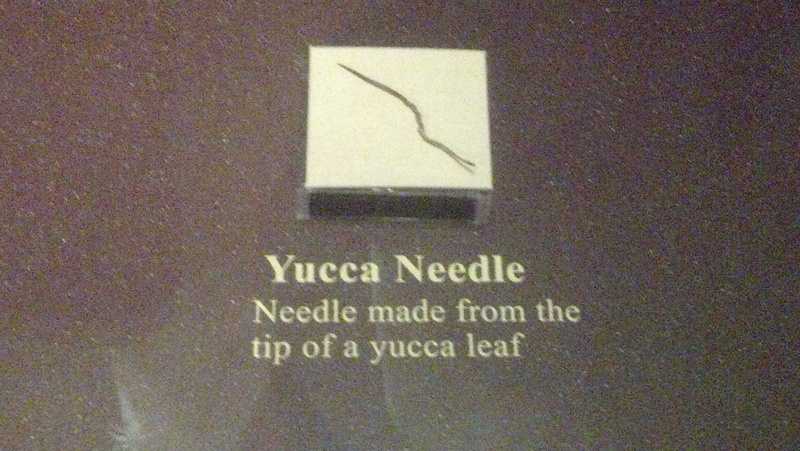 and, using a yucca needle doesn’t look like it will slide easy. 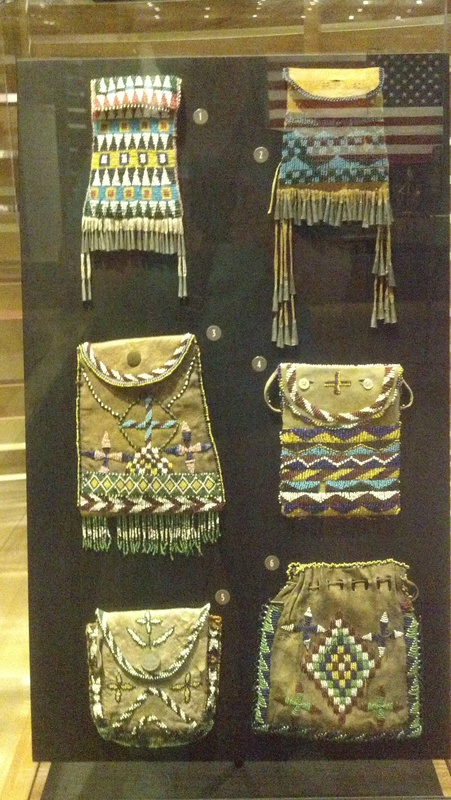 The textiles at the Heard Museum were fantastic. 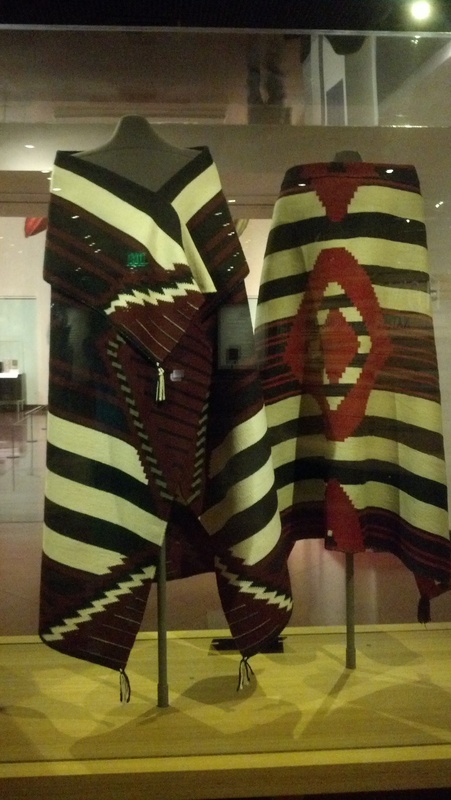 The dye was made from dried cochineal beetles harvested on prickly pear cactus plants. It takes 3,750 beetles to dye a pound of wool bright red! I started a needlepoint piece for a friend who we are seeing next weekend. 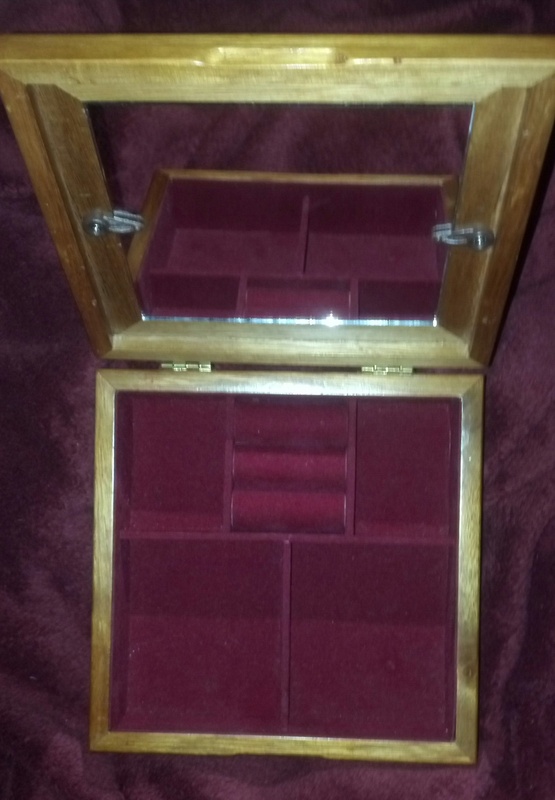 I selected a jewelry box from my stash of finishing pieces which I picked it up at a flea market. I love flea markets! With a small heart opening, I knew I could get it done in a week. But, unfortunately, my husband was sick on New Year’s Eve (day & night). Because we stayed in yesterday & today (he is feeling better now), I focused on this piece AND it is done in just 2 days! My friend Kathy loves wine. So, I thought grapes would be perfect. I decided on a circular Rhodes because it was round and would have dimension (raised center like grapes). 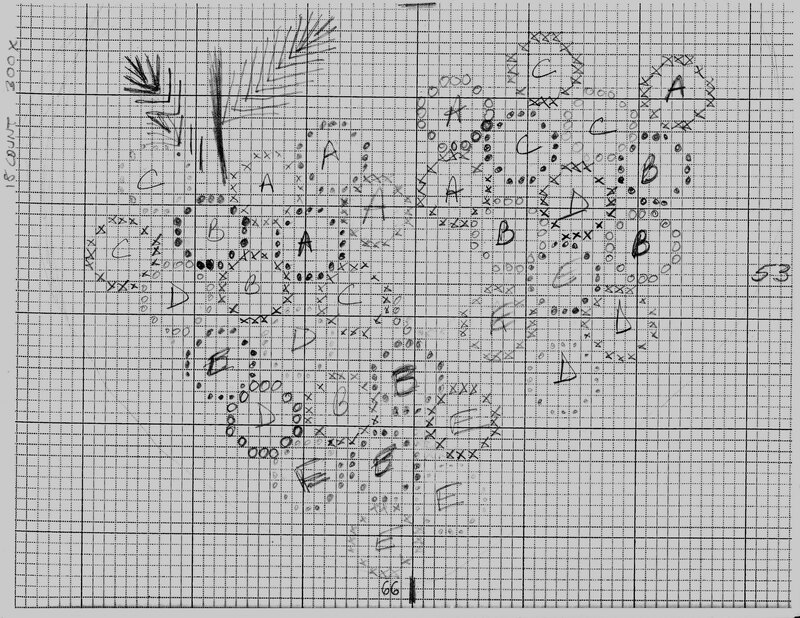 I made a rough draft on graph paper & would adjust as needed. Not making the stitch complicated helped me get it done quickly. And, I allowed myself to be more random as grapes would be in nature. I am not sure how accurate this diagram is now compared to my finished piece. And, the same with 3836/3837. Initially, I tried compensating the Rhodes in between the full grapes but it was looking messy & the full size grapes were disappearing when I used 3 threads of 1 of the 2 matching colors. 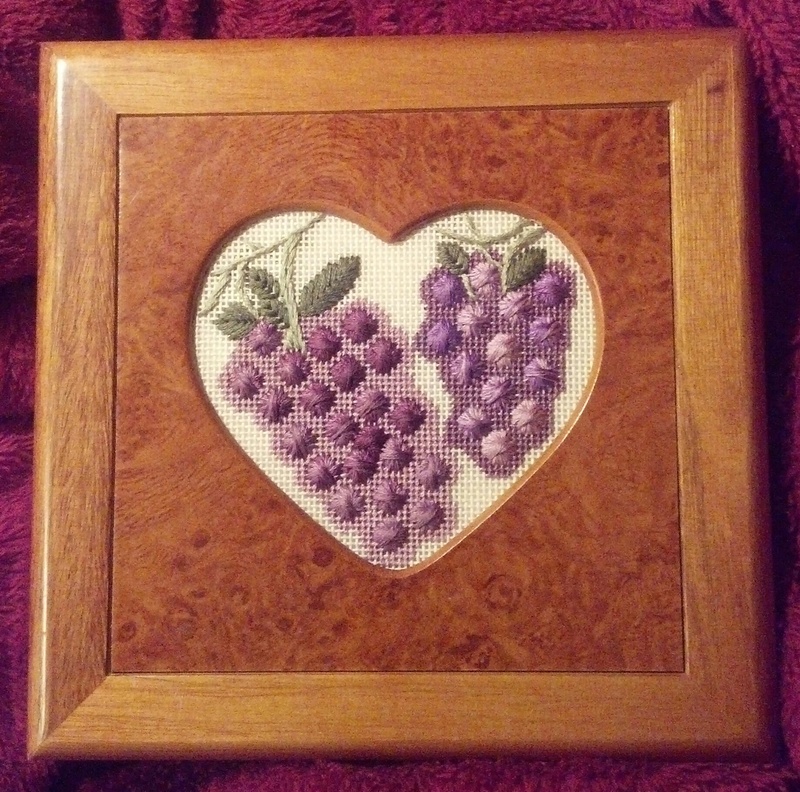 So, I decided that basketweave with a color from the other bunch of grapes would make enough contrast. Then, I added in some branches & leaves (3051/3053). I did attach an extra layer of canvas around the edge so that the needlepoint wouldn’t shift in the insert. But even that wasn’t enough. So, I added a square of white felt which worked perfectly! It was a shame Bill got sick but I enjoyed stitching!